A. L. Burt Company was a New York-based book publishing house from 1883 until 1937. Founded by Albert Levi Burt, it began reprinting home reference works, reprints of popular and classic fiction, before expanding into the field of children's books. Upon Albert Burt's death in 1913, his son, Harry Prentice Burt, took over. Harry Burt retired in 1937, selling the company to Blue Ribbon Books. Its books promoted a romantic view of exciting topics such as aviation and radio. A. L. Burt Company was named after its founder, Albert Levi Burt. Burt was born in Belchertown, Massachusetts in 1843. He was one of fourteen children born to Vila Burt (née Randall) and Levi Burt, a utility man and musician, and the grandson of Reuben Burt, the last surviving veteran of the American Revolutionary War in Hampden County. He was also an eighth-generation New Englander from a prolific family, tracing his ancestry to Henry Burt's arrival in Massachusetts around 1638. Burt grew up on a farm with limited resources and schooling. As a family genealogy put it, other than four months each winter at a small district school, "the rest of the year the farm itself was the alpha and omega of educational opportunities." Burt's father died on January 26, 1860, when Burt was seventeen. Burt moved to Amherst, where he worked as a clerk in a general store for fifty dollars a year along with his board; two years later he moved to Hartford, Connecticut, working for several years as a traveling salesman for a publishing house. During this time Burt came to understand the market that existed for inexpensive artistic, literary, and household books, which many could not afford. In his personal life, Burt married Sarah Prentice Burt in Gilead, Connecticut, in 1872. They had three sons: Harry Prentice Burt (born c. 1874), Frederick Andrew Burt (born c. 1876), and Edward Fuller Burt (born c. 1878). He was a Republican, and according to an obituary had a "retiring disposition"; he was a member of only one organization, Plymouth Church, of which he served for "many years" as a trustee. In 1891, having found publishing success in New York, he donated 100 volumes of his works to Belchertown's Clapp Memorial Library. He was also an authority on bass and trout fishing, and wrote on the subject. Burt eventually gave up his active work in May 1913—"much against his will," per the obituary. After a months-long illness he died in his home at 178 Brooklyn Avenue on 28 December 1913, and was buried in the Cemetery of the Evergreens. Albert Levi Burt began his book-publishing efforts in 1883, even though A. L. Burt Company was not officially incorporated until 1902. In 1883 Albert Burt moved to New York City, and soon thereafter began using a small office at 105 John Street to publish books. He initially focused on home reference works. His first publication was a reprint of The National Standard Dictionary; for this he poured the entirety of his $900 savings into typesetting, providing for paper, printing, and binding on credit. The effort was successful, and within ten years some 250,000 copies had sold. Albert Burt followed the dictionary with a "Standard Encyclopedia" and several works on household art, along with such titles as "Law Without Lawyers," "Household Recipes," "Useful Knowledge," and "The Family Physician." Late in the 1880s Albert Burt turned to paperback fiction, with his Manhattan Library line of books. He also wanted to publish so-called "good literature," and so at the same time began the Burt's Home Library line with 25 titles, eventually reaching 500. In 1887 Albert Burt launched the Boys' Home Library line of juvenile paperbacks, with individual titles priced at 25 cents and a yearly subscription for $2.50; these appear to have been published concurrently with $1 hardcover editions of the same works. The titles, which included first editions as well as reprints, were by such authors as Horatio Alger, James Otis, Harry Castlemon, and Edward S. Ellis. The line comprised 24 titles, the first 19 issued monthly and the remaining quarterly. Seven were by Alger: Joe's Luck, Frank Fowler, the Cash Boy, Tom Temple's Career, Tom Thatcher's Fortune, The Errand Boy, Tom the Bootblack, and Tony the Hero. The first five of these were first editions, though all seven had earlier been serialized in New York Weekly. The final number, Otis's Captured by Zulus—under the pen name Harry Prentice—was published in June 1890. Albert Burt's business grew rapidly, and between 1883 and 1900 he moved into larger offices in lower Manhattan at least four times. Burt remained at 105 John Street until at least November 1884, and by April 1885 had moved to 162 William Street. He remained there until moving to 56 Beekman Street, around June 1888, and staying until at least May 1889. In April 1899 he moved from 93–95 Reade Street to the Jones Building at 52–58 Duane Street, where he occupied the entire seventh floor. He also began to focus on hardcover novels, a response to the saturation of the cheap paperback market; dime novels and other 10- and 15-cent publications were undercutting his own 25-cent titles. The Beverly Gray series by Clair Blank, who also published the three-book The Adventure Girls series, was A. L. Burt's most successful series of the 1930s despite starting publication in 1934. As A. L. Burt expanded, and after it incorporated in 1902, it began targeting both adult and juvenile markets. Zane Grey's second book, The Spirit of the Border, sold some 750,000 copies as an A. L. Burt first edition. Similar success was found with other adult authors, such as Harold Bell Wright and Joseph C. Lincoln. Meanwhile, the Chimney Corner Series began offering 50-cent juvenile hardcovers in 1905; 69 titles were issued under the series in slightly less than a decade, during which the price eventually rose to 60 cents. The company also issued a line of "illustrated cover" juvenile books between 1907 and 1911, with titles by authors such as Ellis, Otis, and Everett Tomlinson. With cheaper options readily available, the dollar books did not sell well; two first editions by Alger, In Search of Treasure and Wait and Win, are now scarce. In 1911 A. L. Burt began issuing series books as part of an effort to compete with the Stratemeyer Syndicate. An early effort simply repackaged four of the books from the dollar "illustrated cover" line: Wilmer M. Ely's books The Young Plume Hunters, The Boy Truckers, The Young Pearl Hunters, and The Young Treasure Seekers, originally published as standalone works between 1905 and 1911, became the Boy Chums Series, and sold for 40 cents each. They sold well, and were supplemented with four new titles. 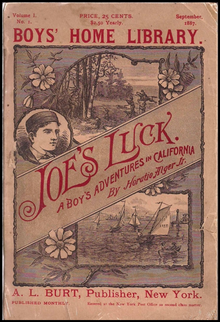 Albert Burt's sons, who were active in the company, continued with series books after their father's 1913 death, initially pursuing reprint rights for existing works; series such as the Jack Lorimer Series, the Oakdale Series, the Boy Scouts Series, and the Border Boys Series were thus acquired and reprinted. New series were also introduced, such as the Bronco Rider Boys and the Big Five Motorcycle Boys under pseudonyms of St George Henry Rathborne. Particular success was had with World War I-themed series, such as The Boy Allies. The series—comprising 13 The Boy Allies of the Army books and 10 of The Boy Allies of the Navy—is considered "the best-known of all series with the war as its primary setting", and presents "the boy heroes practically winning the war single-handedly". After the war ended, A. L. Burt's series books adapted with the times. The Radio Boys Series, started in 1922, coincided with a popular interest in wireless radio—and with the Stratemeyer Syndicate's issuance of an identically titled series. Further series followed; the Beverly Gray mysteries, published from 1934 to 1937 by A. L. Burt, and later by Grosset & Dunlap, were the company's most successful series of the 1930s, selling well despite an economy weakened by the Great Depression. The Beverly Gray series was termed a "soap opera", with the many adventures of its protagonist including three plane crashes. Looking to retire, in 1933 Harry Burt began discussions about a sale with Blue Ribbon Books. In 1937 he finally sold; two years later, Blue Ribbon Books sold its assets and reproduction rights to Doubleday. ^ Erisman, Fred (2006). Boys' books, boys' dreams, and the mystique of flight. Fort Worth, Tex. : Texas Christian University Press. p. 28. ISBN 9780875653303. ^ Adams, Mike. The Radio Boys and Girls: Radio, Telegraph, Telephone and Wireless Adventures for Juvenile Readers, 1890–1945. pp. 6, 42–6. ISBN 9781476623450. Retrieved 24 January 2016. ^ a b c d e f g h "Albert L. Burt, Publisher, Dead". The Brooklyn Daily Eagle. 73 (359). Brooklyn, New York. 29 December 1913. p. 10 – via Newspapers.com. ^ a b c d Burt & Burt 1893, p. 494. ^ Burt & Burt 1893, pp. 492–494. ^ a b c d e Leonard 1907, p. 223. ^ Burt & Burt 1893, pp. 9, 494. ^ "Burts from All Over: Descendants of Early Settler Meet and Make Merry—"Among the Clouds" Burt Welcomes the Clans". The Boston Daily Globe. XXXVIII (96). Boston, Massachusetts. 4 October 1890. p. 4 – via Newspapers.com. ^ Burt & Burt 1893, pp. 493–494. ^ Burt & Burt 1893, pp. 494–495. ^ "Harry P., Burt, 68, Noted Publisher". Brooklyn Eagle. 100 (77). Brooklyn, New York. 19 March 1941. p. 15 – via Newspapers.com. ^ "Frederick A. Burt, Book Publisher". Brooklyn Eagle. 100 (294). Brooklyn, New York. 23 October 1941. p. 15 – via Newspapers.com. ^ Burt & Burt 1893, p. 496. ^ "A Generous Brooklynite". The Standard Union. XXVIII (144). Brooklyn, New York. 11 September 1891. p. 4 – via Newspapers.com. ^ "Albert L. Burt". The Standard Union. L (179). Brooklyn, New York. 29 December 1913. p. 6 – via Newspapers.com. ^ a b c d e f g h Gowen 2009, p. 8. ^ a b c d Burt & Burt 1893, p. 495. ^ "First Editions". The Horatio Alger Society. Retrieved 15 April 2019. ^ a b c d Kasper 2000, p. 3. ^ a b c d e f g h i j Gowen 2009, p. 9. ^ "New Books". Democrat and Chronicle. 52 (319). Rochester, New York. 14 November 1884. p. 5 – via Newspapers.com. ^ "New Books". The Buffalo Sunday Morning News. XII (23). Buffalo, New York. 26 April 1885. p. 2 – via Newspapers.com. ^ "To Write Successful Stories..." The South-Bend Daily Tribune. XXIX (4418). South Bend, Indiana. 5 September 1887. p. 2 – via Newspapers.com. ^ "New Publications". Daily Nebraska State Journal. 18 (300). South Bend, Indiana. 17 June 1888. p. 5 – via Newspapers.com. ^ "Our Book Table". The Plain Speaker. VII (116). Hazelton, Pennsylvania. 19 June 1888. p. 2 – via Newspapers.com. ^ "New Publications". Harrisburg Telegraph. LVIII (120). Harrisburg, Pennsylvania. 18 May 1889. p. 2 – via Newspapers.com. ^ "Literary Notes". The Standard Union. XXXV (298). Brooklyn, New York. 17 June 1899. p. 8 – via Newspapers.com. ^ Gowen 2009, pp. 9–10. ^ Directory of Directors & 1911–12, p. 22. ^ a b c d Gowen 2009, p. 10. ^ a b c Gowen 2009, p. 11. ^ a b Gowen 2009, p. 12. ^ Crosson, Mary. "Series List". University of Missouri-Kansas City. Retrieved 17 February 2019. Abreu, John E. (May 1984). "Beverly Gray: Junior Soap, A Golden Anniversary Retrospective (part 1)". Yellowback Library (21). Burt, Henry Martyne & Burt, Silas Wright (1893). Early Days in New England: Life and Times of Henry Burt of Springfield and Some of His Descendants. Springfield, Massachusetts: Clark W. Bryan Company. "Business Notes". The Publishers' Weekly. LV (17): 704–705. 29 April 1899. Chase, Bradford S. Horatio Alger Books Published by A.L. Burt. Enfield, Conn. (6 Sandpiper Rd., Enfield 06082): B.S. Chase, 1983. Print. Directory of Directors in the City of New York (11th ed.). New York City: Directory of Directors Company. 1911–1912. Gowen, William (September–October 2007). "Other Similar A.L. Burt Covers" (PDF). Newsboy. XLV (5): 6. Gowen, William (January–February 2009). "Worthy challenger to the Stratemeyer Syndicate: A.L. Burt's inexpensive series books, 1905–37" (PDF). Newsboy. XLVII (1): 8–12. Kasper, Robert E. (July–August 2000). "The A. L. Burt Boys' Home Library" (PDF). Newsboy. XXXVIII (4): 3–10. Leonard, John W., ed. (1907). Who's Who in New York City and State (3rd ed.). New York City: L. R. Hamersly & Company. "Spring Lines of the Publishers and Some of the Men WHo Will Show Them". The Publishers' Weekly. XCIX (7): 735–458. 12 February 1921. Sternick, Cary. A Bibliography of 19th Century Children's Series Books: With Price Guide. United States: C. Sternick, 2003. Print. "Publishing Histories: A.L. Burt (1883–1937)." Newport Vintage Books. N.p., n.d. Web. 24 Jan. 2016. This page was last edited on 24 April 2019, at 23:46 (UTC).